The reason I like being around Christians is because I leave feeling refreshed. They put wind in my sails. Have you ever had anyone say something to you that lifted your spirits and sent you soaring? This week, we are doing this very thing for others. Can you find a stranger or someone you just met and find a way to encourage them. 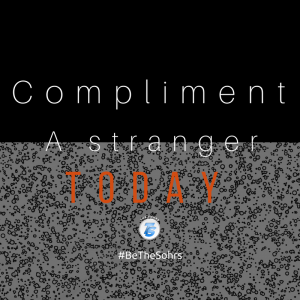 Our “BeTheSohrs” focus is “compliment a stranger today!” Being that breath of fresh air for others is what we, Christians, do and we do it well. It’s time your time to BeTheSohrs!